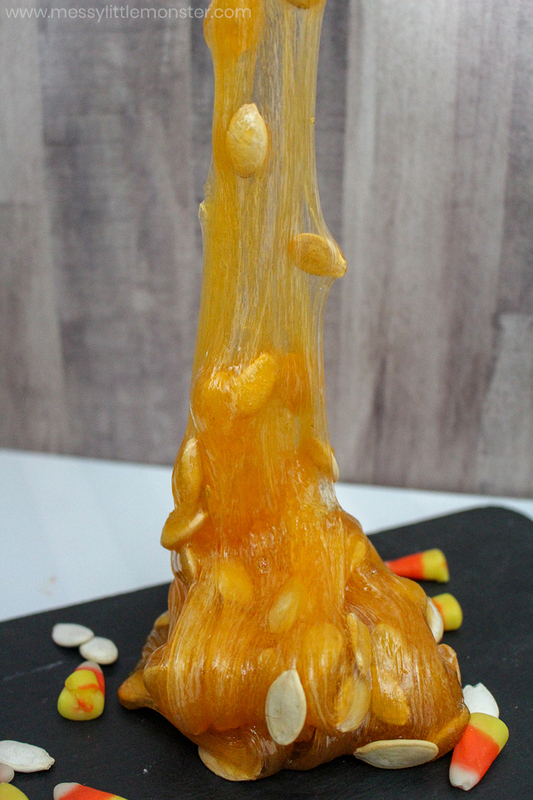 The kids are going to have a BLAST with this pumpkin slime recipe! 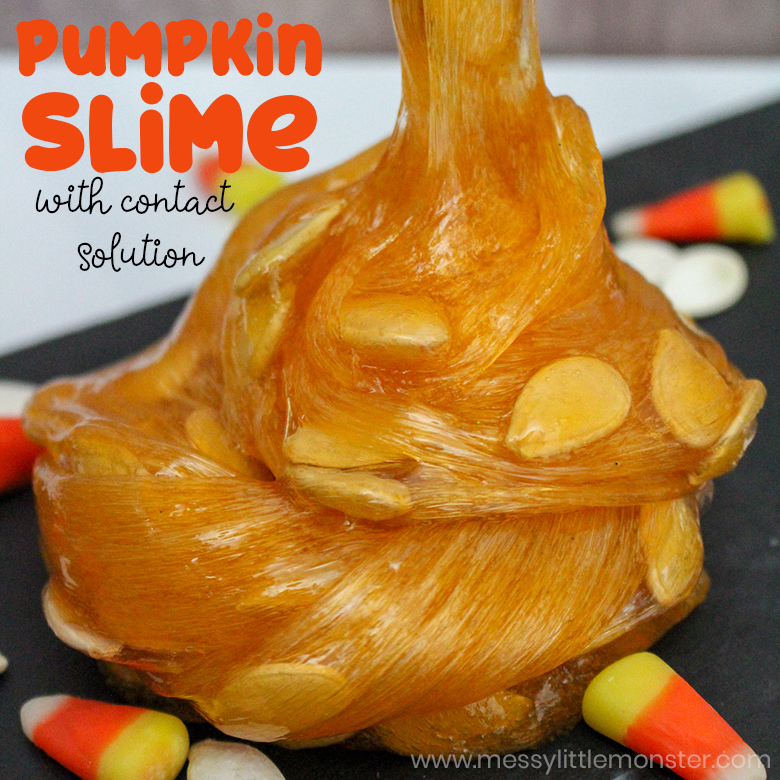 We love contact solution slime recipes as they are super easy to make and the pumpkin slime recipe we are sharing today has real pumpkin seeds mixed in. 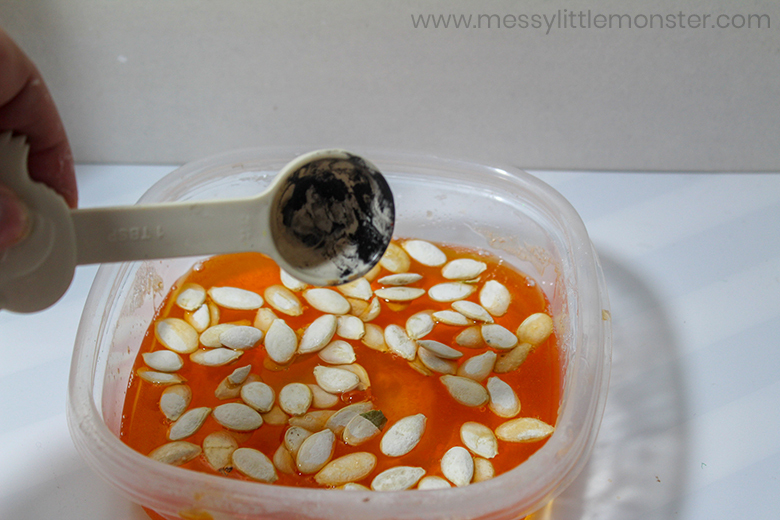 Making pumpkin slime is one of the best Halloween activities for kids at this time of year as it's so much fun. You can even pair this fun pumpkin activity with a favorite Halloween storybook! Just follow the step by step directions below to learn how to make slime with contact solution. 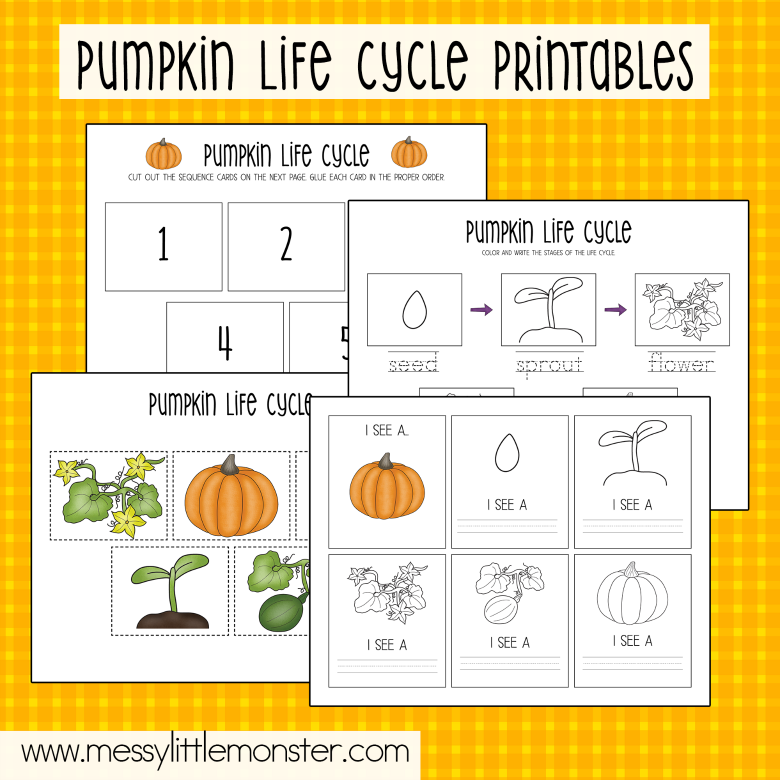 If you're looking for more pumpkin Halloween activities for kids you might like to take a look at the pumpkin life cycle. These printable pumpkin worksheets are perfect for young children that are interested in finding out where pumpkins come from. We have lots more fun pumpkin activities too, preschoolers will love this puffy paint pumpkin craft and kids of all ages will enjoy making and eating this jack-o-lantern halloween snack! We especially enjoy these fun little mini pumpkin pizzas at this time of year. 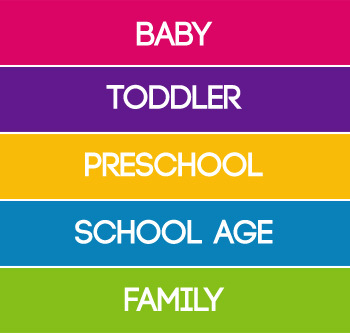 To keep your kids busy with fun slime recipes, be sure to check out the ultimate slime guide! 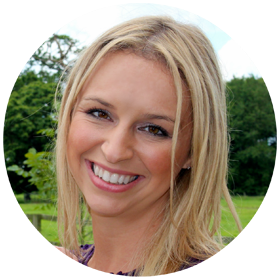 The Slime guide is a book written by a freind of mine, Sarah, who is a total Slime expert! The recipes in her book are some of the best! The pumpkin slime recipe that we are sharing today would be a great addition to a Halloween playdate or party! Just scroll down below to learn how to make slime with contact solution! Slime Safety Notice - Adult supervision is required. Thoroughly wash your hands before and after making and playing with slime. Do not substitute any ingredients in our slime recipes. Some contact solution brands work better than others, only contact solutions containing borate or boric acid will create slime. I've supplied links to Amazon for easy purchasing! Just click the links below to be taken to the product pages. As an Amazon Associate if you use the links I may earn from qualifying purchases at no extra cost to you. Thank you for supporting our work. Before you get started, gather all your supplies for your pumpkin slime recipe! It's so much easier when you have prepared everything ahead of time. Once you have gathered your supplies, it's time to get started on your pumpkin slime recipe! 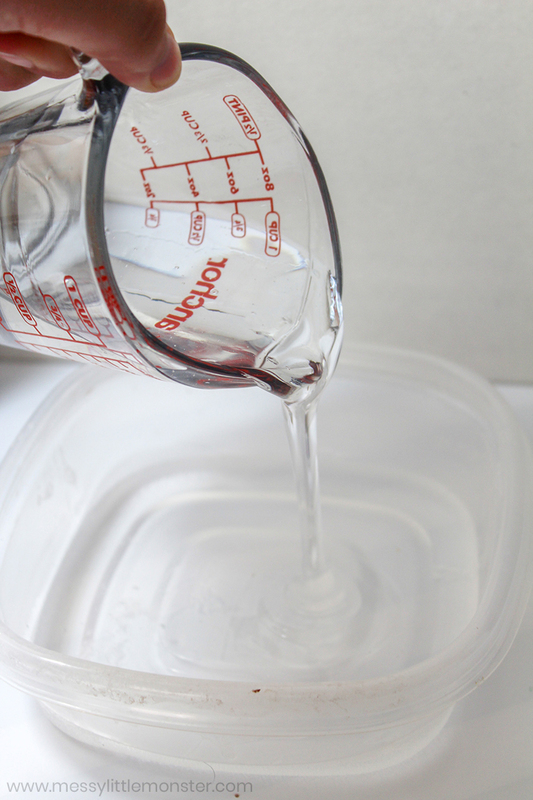 Start by pouring the bottle of glue in a small bowl and then add the water and baking soda; stir well. 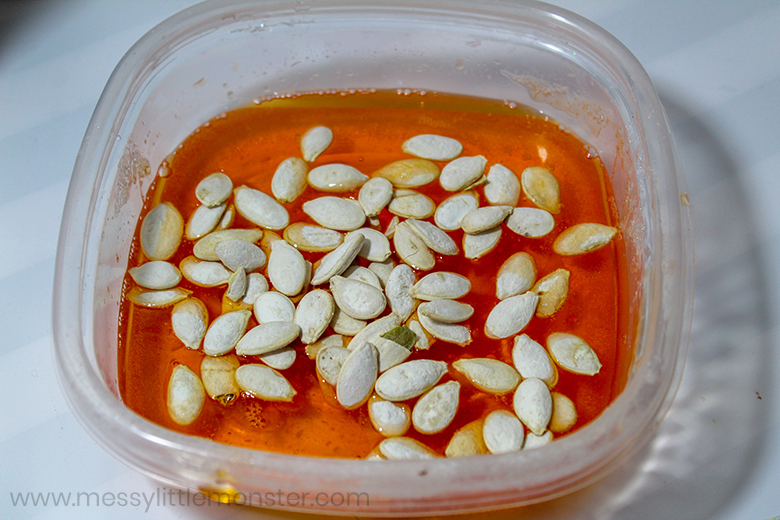 Next, drop in a few drops of food colouring and stir before adding an appropriate amount of pumpkin seeds. Then, add a few drops of pumpkin pie fragrance oil. After you've done that, add your contact solution - it will instantly start to form and be a little sticky at first! Continue mixing the solution and knead the slime until you reach the desired consistency and it is no longer sticky. Now it's time to play! 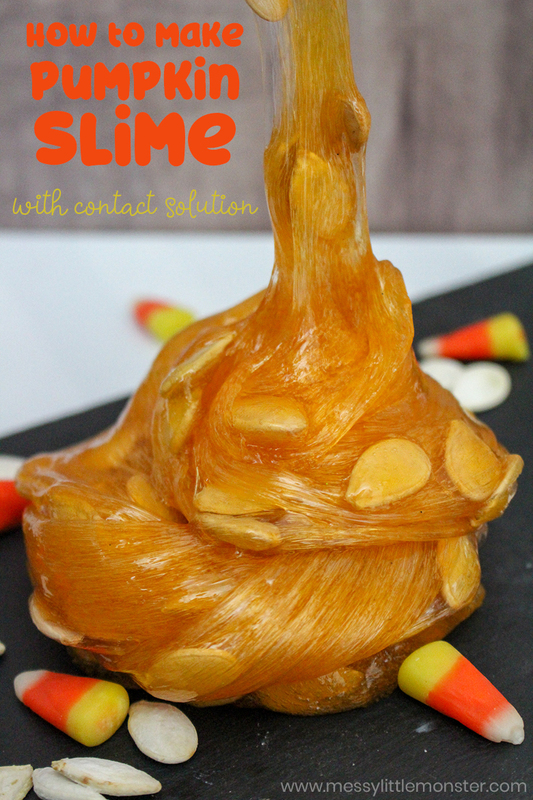 This pumpkin slime recipe is one of our favorite Halloween activities for kids. Kids will love helping to make and play with this pumpkin slime. 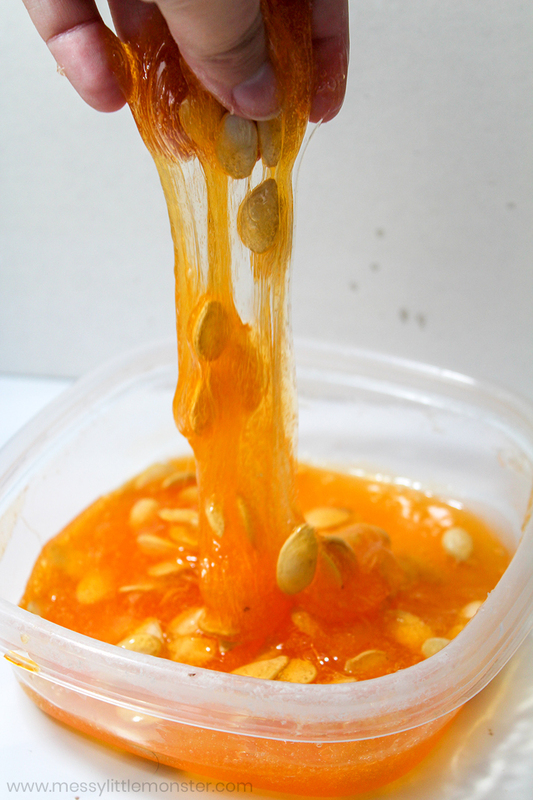 You can even pair making pumpkin slime with reading a favorite book like Itsy Bitsy Pumpkin or even Seed, Sprout, Pumpkin, Pie and talk about how the seeds turn into a great big pumpkin! Once you are done with playing with the pumpkin slime, make sure to store in an airtight container! You can pull it out to play with again and again for more Halloween fun! If you love fun slime recipes, be sure to try this sparkly silver slime recipe too! You'll also love this ultimate slime guide to keep the kids busy with fun slime recipes all year round! We hope we have lots of fun as you learn how to make slime with contact solution! Playing with slime really is a great activity for kids! 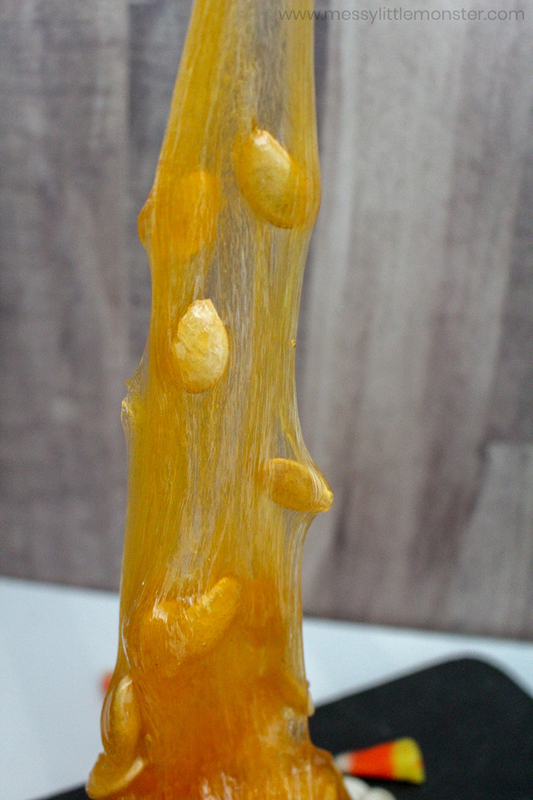 They will LOVE playing with this pumpkin slime recipe as they get ready for Halloween this year. If you are looking for Halloween activities for kids this really is the best!